Greek life at the University of Rhode Island is an aspect of the college experience that has about 15 percent of students participating in one of college’s biggest communities. Joining any organization on campus requires more time of students. However, joining Greek life seems to entail a greater commitment. With both sororities and fraternities, Greek life makes up 2,400 members with 50 core leaders. The idea around the brotherhood and sisterhood has been around for years and is still prominent in many public universities around the country, with an even bigger popularity in the South. Director of Greek Life Dr. Stephen Simo, alum of Massachusetts College of Liberal Arts and member of Kappa Delta Phi thinks that students are glad to partake in the commitment because of the sorority or fraternity’s beliefs and philanthropy. 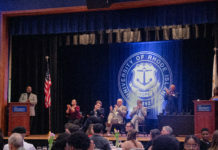 URI’s Greek community holds four core values that the organizations are expected to adhere to: fellowship, scholarship, leadership and community service. “For some students it’s on the forefront, but for others it’s not,” said Simo. “Others get it as they go along.” Simo said it is not just about the social life, and that the students still have to maintain the organization. Simo said that Greek life members continue to give back to the community even after they graduate. “But we don’t really know when it clicks,” Simo said. There is a deep affinity built to university and Greek life members, who tend to donate and often in large sums. Administrators who oversee the fraternities and sororities have guidelines and expectations of the students who pledge to values. Simo said that if something is going wrong, it generally comes to their attention. As part of alcohol education and prevention, the Greek life staff offers support programs that touch upon substance free housing policies, first week party moratorium and fraternity dry rush. They also offer human development and family study and CSV courses that many presidents of the houses are enrolled in. “We have had risk management problems in the past,” Simo said. Hazing and alcohol and drug abuse problems have caused houses on university property to be shut down, like last year’s Tau Epsilon Phi, or suspensions or expulsions to occur. Simo quoted Greek life speaker Dave Stollman who said, “If we are living up to the values, fraternities should be the safest place that anybody could be.” However, having a large number of 20-somethings in one household can cause a ruckus. This is not only subject to Greek life, but also for athletic teams and other student groups. There are 16 fraternity houses and 10 sorority houses on university land, but housing corporations own them all. The houses are run by five to seven alumni that are on a housing board. With organization fees ranging from $300 to $1,000, Simo still thinks it is an economically advantageous option when providing housing for students. The dues that students are required to pay cover national dues, chapter dues and insurance. Simo said that the Greek life housing costs are comparable to university costs or sometimes less. Simo did acknowledge that it was certainly a financial commitment. The houses do not keep record of whether payment is received from students or their parents. High costs are often the reason why students drop from their sororities or fraternities. Zeta Beta Tau has lost two members so far this year because of high fees. Dan Mateus, a staff member of the Good 5 Cent Cigar, could no longer afford the high cost of Greek life and subsequently left his fraternity in Spring 2013. “I left Sigma Chi due to the high cost of the dues that I personally had to pay myself on top of dealing with tuition and other living expenses,” Mateus said. A popular conception on college campuses is that if one is part of Greek life, they are “paying for their friends.” Simo challenged the remark and thinks this is a “common knock on Greek life.” He thinks the dues are supporting the beliefs and events that make up the organization, but it’s not about buying friends. Alongside its fiscal demands, members are required to dedicate their time to their organizations. Zeta Beta Tau president, Kyle Simons, said he spends 25 to 30 hours a week at chapter meetings, philanthropy, recruitment, fundraisers and study hours. Zingarelli said his average of eight to 10 hours account for planning and other fraternity happenings. Involvement from the rest of the members is expected, but various presidents said they understand if someone cannot make it with enough notice. Though some interviewed Greek life members feel they still receive flack from the organizations if they cannot make events. “It’s so that everyone is involved and doing their part,” Simons said. According to Simo, Greek life numbers have doubled in size for URI and the amount of community service done by its members has also grown. Students seem to be glad to participate in the community even if the commitment to the organizations is high. Next articleWho’s paying your tuition?